Many of MIRO's user-serviceable parts are under the body shell, being the large white plastic part covering the main body. This page documents how to remove the shell to gain access to these parts. In order to remove MIRO's body shell, the head needs to be in the down position, i.e. with the neck member at the front end of the neck slot. MIRO has a special mode called "shell release" mode in which the head is moved to this position. There are two ways to engage this mode, described below—choose one or the other. Turn MIRO upside-down, supporting him between your thighs, as shown above. Switch MIRO on. After a few seconds, shell release mode will engage and the head will move slowly to the down position. Switch MIRO off before proceeding. With MIRO the right way up, switch on. Immediately after this, place the whole palm of your hand across MIRO's back, as shown above, to contact all four touch sensors. Hold this position for a few seconds until shell release mode is engaged, and the head will move to the down position. Switch MIRO off before proceeding. 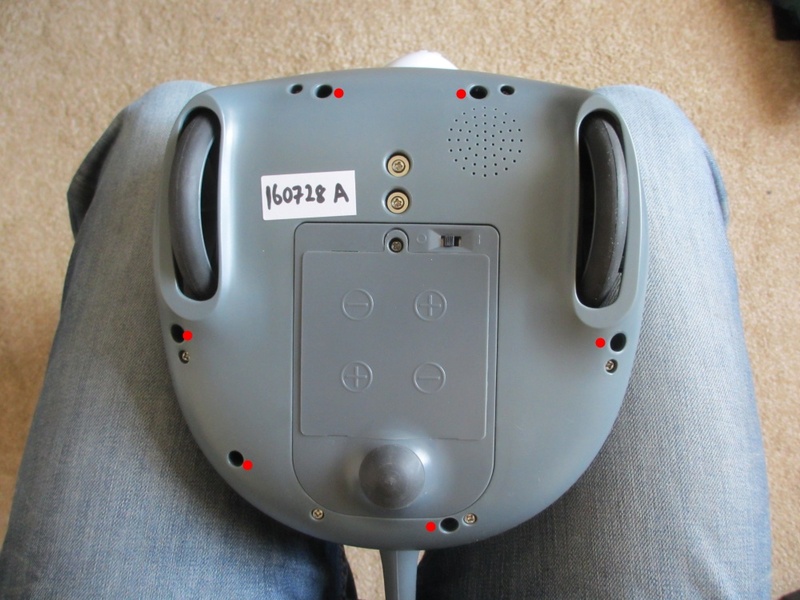 It may take a few attempts to get the knack of this technique - the contact sensors are arrayed down the centre line of the body shell, from the rear of the neck slot to just above the tail, and contacting all of them at once is easier after some practice. This method will not work if you are touching the sensors when you turn MIRO on, since auto-calibration of the sensors will fail if your hand is already in position. Turn MIRO upside-down, supporting him between your thighs, as shown above. There are six screws on MIRO's underside securing the body shell. They can easily be confused with the neighbouring screws which hold MIRO's base together. The body shell securing screws are marked red in the image—remove only these six screws. You will need a simple PH1 (Phillips size 1) screwdriver with a narrow shaft. A driver with a plastic-coated shaft, or a driver with interchangeable bits, is unlikely to fit. Now, being careful to support the body shell which is now detached from MIRO, turn MIRO back the right way up. You can now withdraw the shell carefully, lifting the rear edge first and then sliding the front edge up and back so that the neck slot clears the neck member. Release the shell from the flexible slot cover that fits into the channel on the underside of the body shell. Finally, unplug the connector for the body shell touch sensors from its socket at UC1:J2, noting its location for refitting. It is not recommended that you operate MIRO with the body shell removed, since the shell contributes to supporting the neck. Refitting is the reverse of removal, but note the following points before you start. If you have operated MIRO with the shell removed, you will have re-engage shell release mode before refitting. 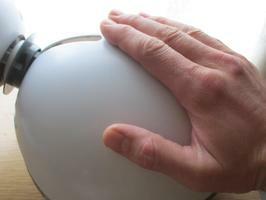 You can do this by using the DIP switch to engage shell release mode, or by using one of the "shell on" methods above. Take great care to guide the neck into the slot in the base as it is lowered to avoid possible damage to the mechanism. If you used the DIP switch, be sure to set it back to mode zero before you reattach the shell. Before refitting, visually locate the six plastic pillars in the base that will mate with the plastic pillars hanging down from the body shell and ensure that none of them is fouled by cables or other components, to avoid possible damage to fouled parts. Reconnect the body shell touch sensor board to UC1:J3, as shown in the image to the right. Engage the flexible slot cover with the channel in the underside of the body shell. Engage the neck slot in the body shell with the neck member. Starting at the front edge, refit the body shell, using firm but careful pressure to mate all six pillars (this step requires a little imagination, but becomes easier with practice). Flip MIRO over, holding the shell in place, and reinsert the securing screws, massaging the shell as necessary to engage the screws.